Lots of states have golf trails, and some of them have received more recognition than Louisiana’s Audubon Trail. That’s unfortunate, because the Audubon offers much more than the others if your golf trips take into account non-golf attractions. Make no mistake, the 15 courses on the Audubon Golf Trail are good. The trail was named for naturalist/artist John James Audubon, who painted many of his bird studies in Louisiana, and many of the courses on the trail are members of the Audubon Cooperative Sanctuary. They undergo rigorous screening to become members. We covered six of the courses in as many days in 90-degree early-summer heat. They all kept our attention throughout, and each had its unique features. 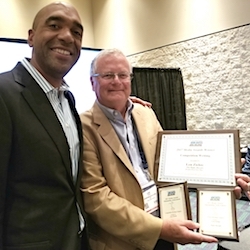 Best of the lot – but not by much – was Gray Plantation in Lake Charles – the state’s golf hotbed. Rocky Roquemore, a Georgia-based architect, became prominent in the Chicago area in 1986 when one of hls designs, Pine Meadow in suburban Mundelein, was named America’s Best New Course by Golf Digest. He also did some work on Cog Hill’s famed Dubsdread course in Lemont, Ill., so I had some familiarity with his architectural style. The bunkering on the par-3 eighth is Gray Plantation’s most memorable hole. I got another taste of just how good an architect Roquemore was while playing Gray Plantation. It’s a player-friendly layout with its wide fairways, but it has a great mix of holes. Most notable are a double dogleg par-5 at No. 7 and the par-3 at No. 8 with its stunning bunker complex. 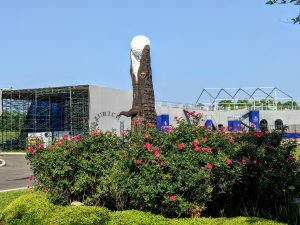 Gray Plantation is one of those “semi-private’’ facilities. It has memberships but also accepts public play. An indoor Golf Academy is also being developed. Though there was some debate among my most knowledgeable traveling companions, from my perspective it was the most enjoyable of the Audubon Trail courses. Understandably the low handicappers might prefer TPC Louisiana, annual site of the PGA Tour’s Zurich Classic of New Orleans. It’s a Pete Dye design, and you can never go wrong choosing a Pete Dye course. On our visit the tournament scaffolding was still in evidence, though any comparison between our play and that of the PGA Tour guys was purely coincidental. The Atchafalaya at Idlewild spotlighted the habitat that lives on the course with its tee markers. 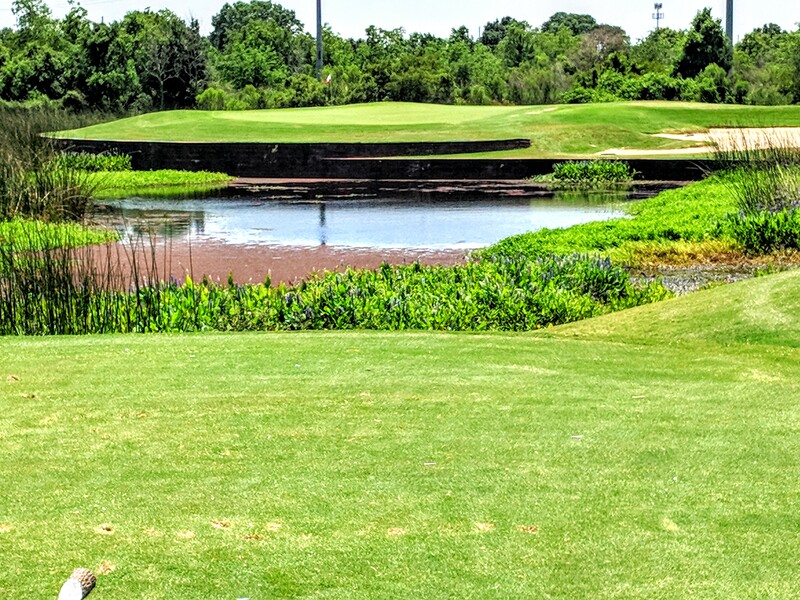 The Atchafalaya at Idlewild, in Patterson, is a fun track designed by Robert von Hagge. It has five lakes and some dramatic elevation changes but its most unique touches are the tee markers – they’re not color-coded, but rather are named after the habitat in the area. 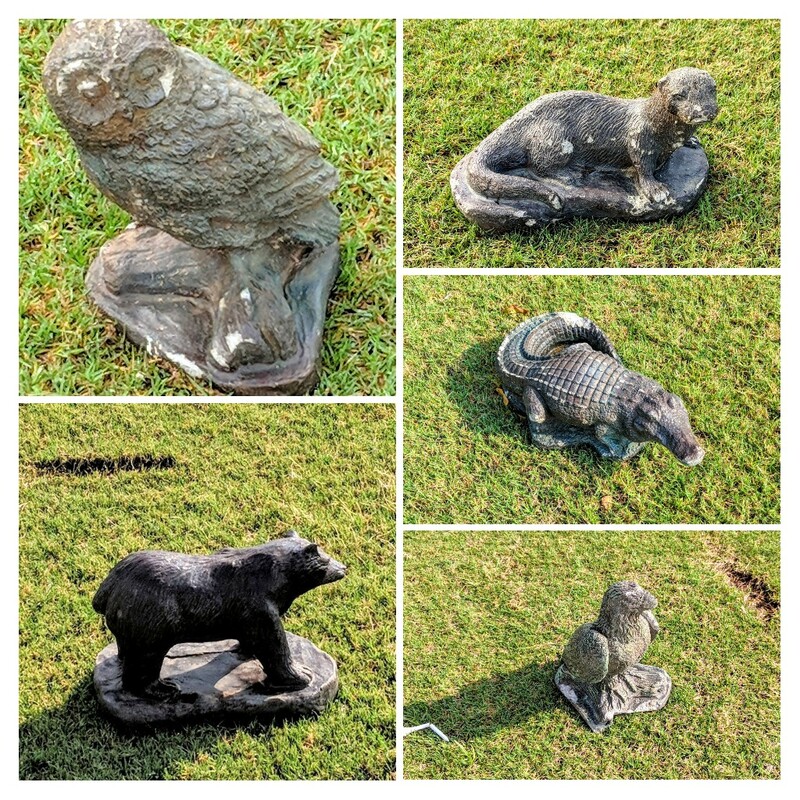 The tees, from front to back, are Otter, Owl, Eagle, Bear and Alligator. I hit from the Owls, a wise move on my part. The 150-yard markers were also unusual. Rather than using the standard stakes, these were marked by Cypress knees. The camouflage-painted golf carts also gave the course a refreshing look. The Loyola University chapel overlooks the Audubon Park course. The Wetlands, in Lafayette, is a tricky layout devised by Frank Burandt, who had formerly been with Nicklaus Design. He made use of the many lakes and – obviously as per the name – wetlands areas. Water comes into play on 11 holes and the greens are well-bunkered. First course on our agenda, The Golf Course at Audubon Park, was planned as a warmup round. It’s the oldest golf course in Louisiana, dating back to 1898 when it had only six holes. Audubon Park underwent a major transformation when Georgia-based architect Dennis Griffiths created the present layout in 2001. 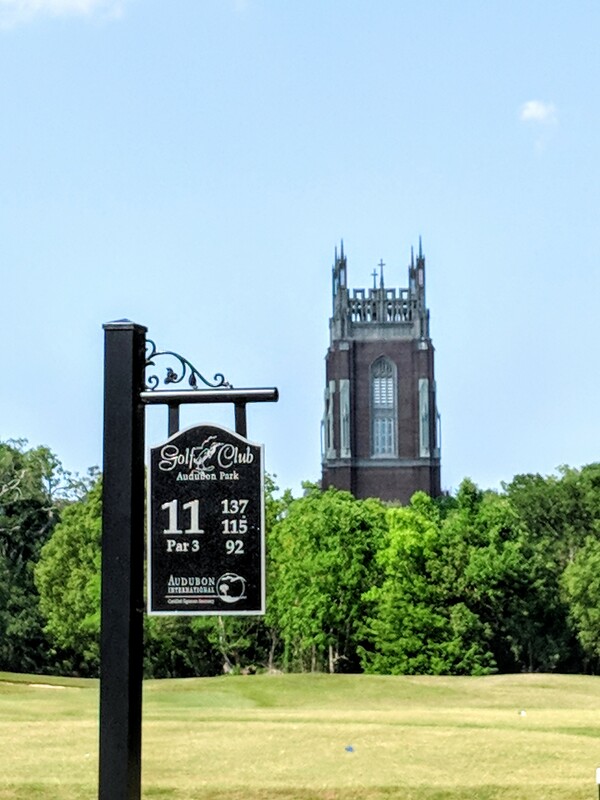 The length – only 4,220 yards from the tips – may give the impression that Audubon Park is not “real’’ golf. Each nine has one par-5, two par-4s and six par-3s, all situated in a park that includes a zoo and has a walking/biking trail within the borders of the course. You also get a nice view of the Loyola University chapel. 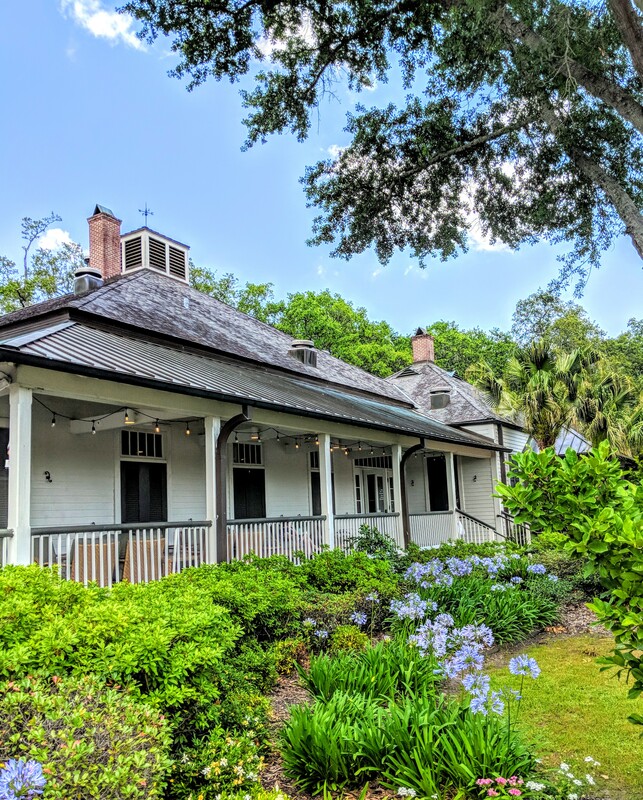 Personnel from that school as well as those from nearby Tulane University utilize the facilities, which include a plantation-style clubhouse with good dining options and an outdoor venue for social events like weddings and birthday parties. In short, Audubon Park is a most fun place for more than just golfers. TPC Louisiana is big on alligators. Some of the live ones were even televised during the PGA Tour’s Zurich Classic of New Orleans. 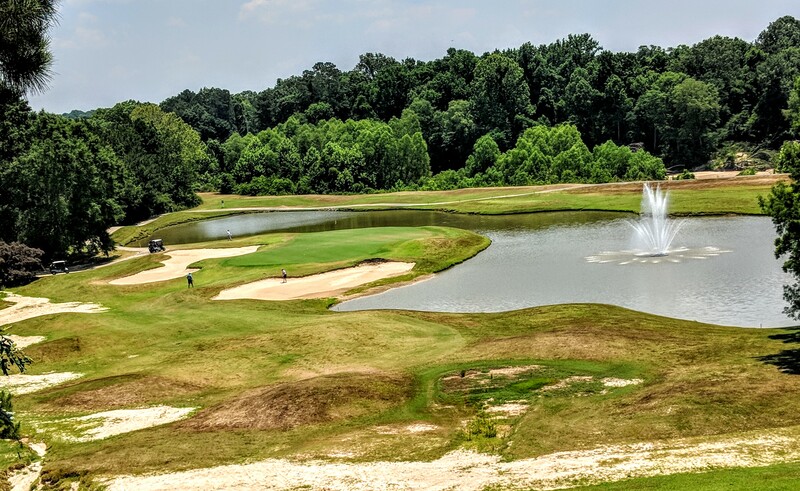 While The Bluffs on Thompson Creek, in St. Francisville, was shaking off some issues related to flooding, the Arnold Palmer designed course had some excellent holes – especially the 17th, a downhill par-3, and the uphill 18th. James Audubon once studied and illustrated the bird life on what is now holes 11 through 13, and 32 of his paintings were made when he resided in the area. 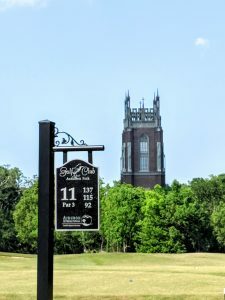 Other courses at the Trail are Black Bear, the Louisiana State Park’s only course in Delhi; the 27-hole Olde Oaks near Shreveport; Cypress Bend Resort in Many; Tamahka Trails at Paragon Casino Resort in Marksville; OakWing, in Alexandria; Carter Plantation, designed by Louisiana native and one-time PGA Championship winner David Toms, in Springfield; and three Baton Rouge area courses — the Robert Trent Jones-designed Santa Maria, links-style Copper Miller and The Island, carved out of a sugar plantation in Plaquemine. 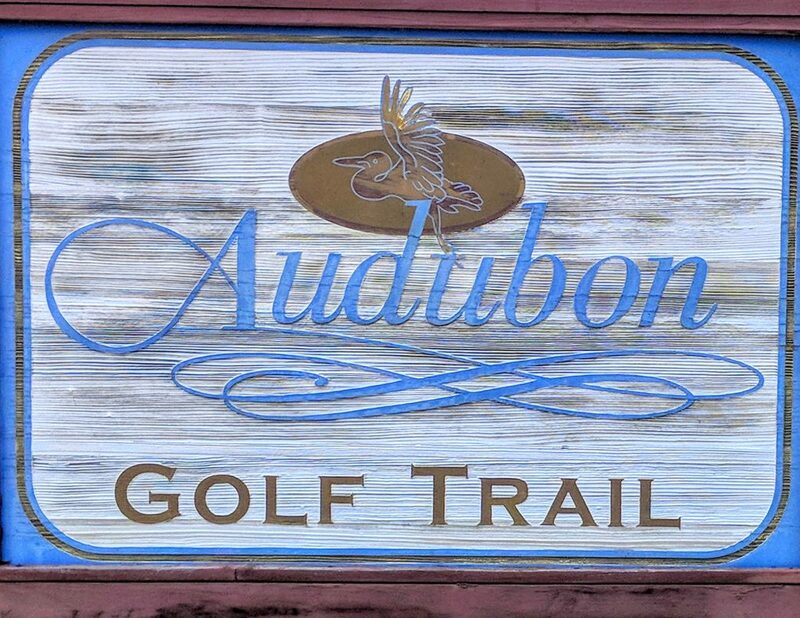 Unlike most of the other golf trails we’ve visited, the Audubon has signage on both the nearby major highways as well as the course entrances. The courses aren’t difficult to find. 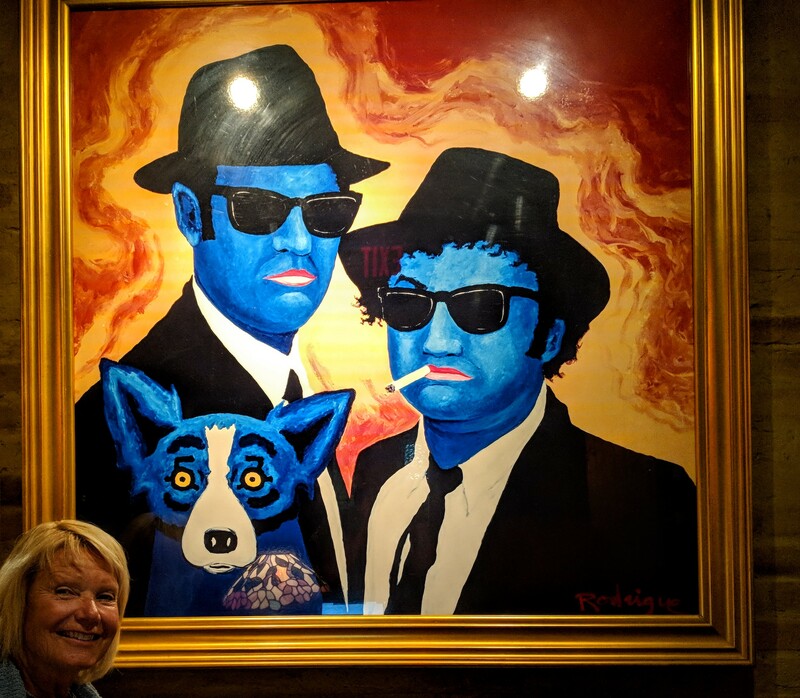 George Rodrigue became a popular artist when he put blue dogs with haunting eyes in his paintings. 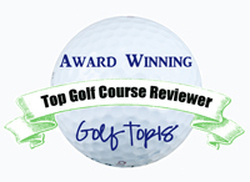 There are other quality layouts off the trail, most notably Contraband Bayou and neighboring Golden Nugget, both by the L’Auberge Casino Resort, and The National Golf Club of Louisiana. They’re all in the Lake Charles area. Just as New Orleans is more than just Mardi Gras, Louisiana is more than just golf. But, the golf is good, affordable and – perhaps best of all – accessible to far more attractions than most of the nation’s other golf trails. While in New Orleans we hung out for a while at the French Quarter where we dined at Dickie Brennan’s Tableau and enjoyed the night life of the Bourbon O Bar at the Bourbon Orleans Hotel. The historical offerings were outstanding in upscale St. Francisville, particularly a church cemetery that had gravesites dating back to the mid-1800s. We also were backgrounded on the once brutal but now reincarnated Angola Prison. No. 17 at The Bluffs, an Arnold Palmer design, has a stunning, and most challenging, par-3 at No. 17. We petted baby alligators while getting a tour of the Bayou Rum distillery in Lacassine. We enjoyed a terrific Cajun style dinner at the Jack Daniels Bar & Grill at L’Auberge Casino’s Jack Daniels Bar & Grill where super chef Lyle Broussard gave us a backgrounder on each offering. 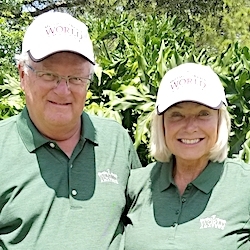 We learned how Tabasco has been made on Avery Island for the last 150 years and we had both a French-style breakfast and spirited musical pre-dinner entertainment at Mouton Plantation Bed and Breakfast in Lafayette. We also enjoyed a scenic boat cruise and another great meal on board at Lake End Park in Morgan City. Obviously there’s plenty to enjoy in Louisiana besides the golf. No. 17 may be the easiest hole at The Wetlands, but it is also the prettiest. What intrigued us the most was the Blue Dog Café in Lafayette. It’s famous for more than its cuisine. The food is served amidst a collection of artworks by artist George Rodrigue, who became famous after he started including blue dogs with haunting eyes in his creations. This side trip was made even more memorable when we met Jacques Rodrigue, son of the famed artist who passed away in 2013. Jacques gave us an inside look at the work his father had done. You can’t help but smile after learning that tidbit. Indeed, Lafayette might be America’s Happiest City, but everyone we encountered in Louisiana seemed happy with their surroundings, too. Appreciating the “Welcome to Lafayette” marker requires personal participation. The plantation-style clubhouse at Audubon Park is the center for all kinds of activities every day.